One of NJPP's key recommendations is to change the “net benefits test,” which is intended to ensure that the new tax revenue generated by a subsidized project exceeds the cost of the subsidy. The current formula is lopsided: benefits are counted over 35 years and subsidy costs over 15 years, the latter being the length of time the company must meet its performance obligations to receive the maximum award. 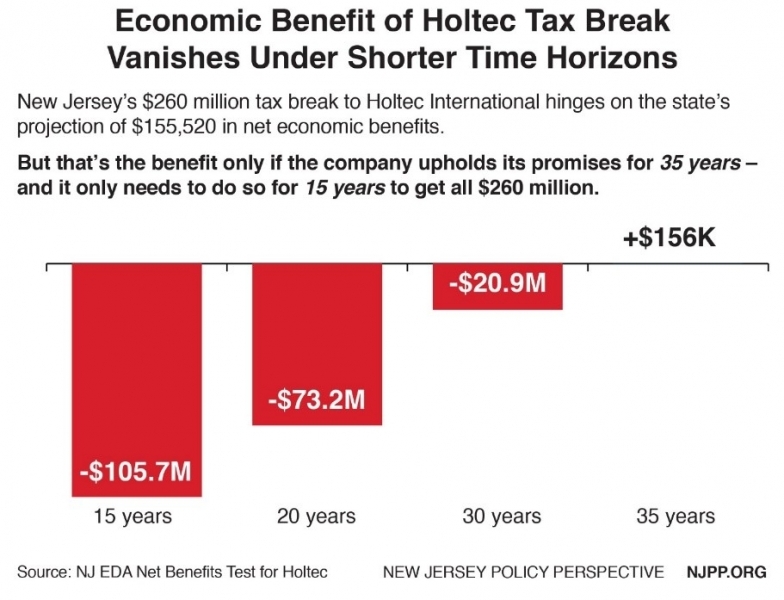 NJPP’s analysis of a $260 million tax break to Holtec International shows how this works. If Holtec keeps performing for 35 years, the state gets a net benefit of $156,000. Yet if it were to leave the state or significantly downsize after 15 years, the New Jersey would experience a loss of up to $105.7 million.